The best Christmas decorations can be found right here at Christmas World. 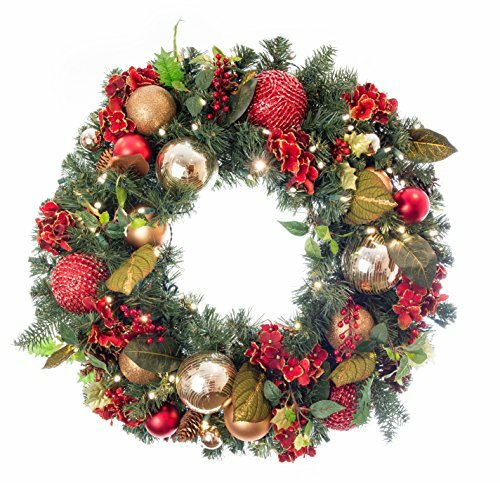 Pre lit Christmas Wreaths are a must have if you want to impress your guests during the holidays. This one of a kind battery operated wreath is sure to be one of the best Christmas decorations you own. This elegant Christmas decor is great for both indoor or outdoor use. You won't be disappointed with this artificial Christmas wreath hanging above your mantle. The unique - handcrafted design is filled with life like hydrangea flowers that are complimented with large red beaded ornaments, sparkling gold ornaments, and rustic pinecones; these are the best xmas Wreaths available. The scarlet hydrangea collection captures what the Christmas spirit is all about. Without a doubt, this will one of our be our #1 best xmas decorations for 2016. The UV coating adds durability to withstand the outdoor weather, or hang indoors above your mantle. This lighted wreath comes fully equipped with a steel frame which makes hanging effortless, and maintains its shape for seasons to come. If you have any questions about this product by VILLAGE LIGHTING COMPANY, contact us by completing and submitting the form below. If you are looking for a specif part number, please include it with your message.